Sir (Arthur) Henry McMahon (18621949) was an army officer and colonial governor. Most of his early career was spent on the north-west frontier of India. In 18946, as a British commissioner, he demarcated the boundary between Afghanistan and Baluchistan, and during 19045 he was the arbitrator on the boundary between Persia and Afghanistan. In 191314 he negotiated a treaty with China and Tibet. When the First World War broke out he was appointed High Commissioner for Egypt under the British protectorate, at the suggestion of Lord Kitchener. 'Between 1915 and 1916, without closely consulting the British government, Sir Henry conducted secret correspondence with the sharif of Mecca [Hussein bin Ali], encouraging an Arab uprising against the sultan-caliph. In return for an Arab rebellion McMahon loosely promised independence in certain areas of the Middle East, but he failed precisely to stipulate which parts of former Turkish territory he was prepared to hand over to Arab control. The extreme vagueness of the often confused and ambiguous correspondence between McMahon and Hussein . . . caused almost immediate controversy between the Arabs and the British empire over its differing interpretations, especially about whether it included Palestine'  Oxford Dictionary of National Biography. In 1919 he was the British commissioner on the Middle East International Commission at the Paris peace conference. In 192025 he chaired the management committee and sat on the board of the British Empire Exhibition at Wembley, London. 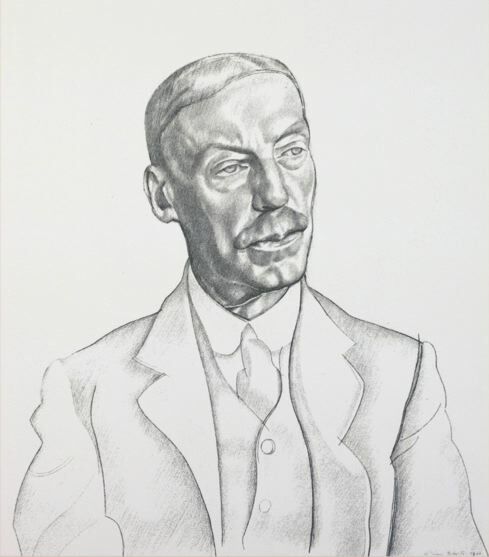 Lawrence described this portrait as 'absolutely splendid: the strength of it, and the life: it feels as though at any moment there might be a crash in the paper and the thing start out' (21 Oct. 1922).